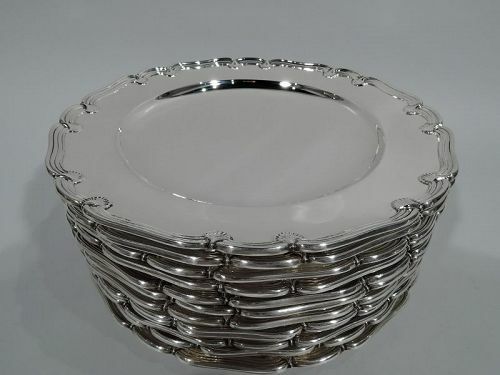 If youre searching for a lovely set of vintage sterling silver dinner plates to create a charming display, add to your silver collection, or entertain your guests with at your next party, youre sure to find a set that you love at Nelson & Nelson Antiques. This collection of eye-catching antique dinner plates includes elegant styles that mix and match with your existing decor or desired theme. Styles include Art Nouveau, Edwardian, American Gilded Age, and more. Depending on the design, these sterling silver dinner plates feature gorgeous ornamentation including naturalistic floral patterns, sweeping foliage, and sumptuous scrolled trim. While some antique dinner plates date back to the 19th century, these plates are offered in very good to excellent condition. Depending on the collection, these stunning pieces are available as chargers or dinner plates and are sold in sets of 10 or 12. 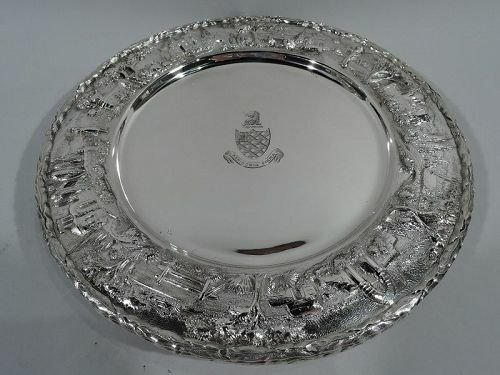 Most plates are hallmarked. Some plates include the retailers name, makers mark, or date symbol. Turn-of-the-century sterling silver dessert set with world’s fair exhibition history. Made by Tiffany & Co. in New York. This set comprises 12 plates and 2 compotes. Each plate: Hexagonal well bordered by bead-and-reel surrounded by applied and open rim in relief comprising fruit baskets joined by rinceaux scrolls and garland. Each compote: Same with raised and gadrooned foot on three leaf-mounted volute scrolls. 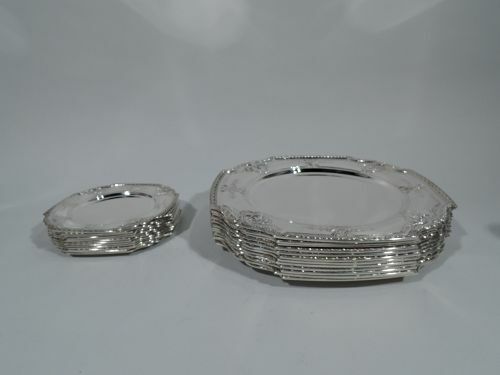 Set of 12 sterling silver appetizer plates. Made by Tiffany & Co. in New York, ca 1910. Each: Circular well, short foot, tapering shoulder, and scrolled and molded rim with applied scallop shells. Perfect for the buffet. Hallmark includes pattern no. 9509 and director’s letter m (1907-47). Very good condition. Twenty-four Edwardian sterling silver plates. Made by Tiffany & Co. in New York. There are 12 dinner plates and 12 bread & butter plates. 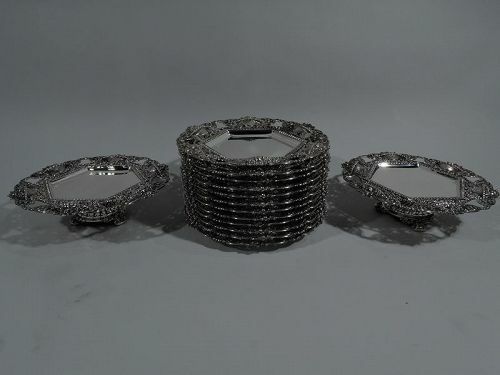 Set of 4 sterling silver plates with landscape rim. Made by S. Kirk & Son Inc. in Baltimore. Each: Plain well engraved with armorial and Latin motto Mediocria Firma. Wide shoulder with chased and repousse rural scenes including old stone buildings, picket fences, and gnarly trees. Imbricated leaf rim. Charming pastoral by a great regional maker. Hallmark (1925-32) with no. 38L and phrase “Hand Decorated”. Very good condition.